Howard Walter "Pete" Ham, 81, of Kingsport, went to be with the Lord on Friday, April 13, 2018, peacefully at his home, surrounded by his family. He was born in Ashe County, NC. 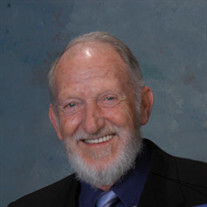 Pete was a member of IBEW 934 and a member of Calvary Baptist Church, serving in many different capacities. He served during the Korean War as a member of The U.S. Army. Pete was a very active person, dedicated to helping others. He was preceded in death by his mother, Maudie Lyall Ham; father, Ulysses Elworth Ham; sister, Virginia Louise Nelson; son, Dennis Ray Ham; mother-in-law, Mary Fay Thomas; and father-in-law, Berry Thomas. Pete is survived by his wife of 60 years, Janice Thomas Ham; daughter, Robin Renée Queen and husband Tony; granddaughter, Tabatha Lenée Nichols and husband Jeremy; great-grandchildren, Aiden and Owen; brother, Charles Edward Hamm and wife Peggy; brother-in-law, Raymond Thomas and wife Janie; and several nieces, nephews and cousins. The family will receive friends from 6 to 8 p.m. on Sunday, April 15, 2018, at Hamlett-Dobson Funeral Home, Kingsport. The funeral service will be held at 2 p.m. on Monday, April 16, 2018, at Hamlett-Dobson Funeral Home, Kingsport, with Rev. Richard Harris officiating. Burial will follow at East Lawn Memorial Park with Military Rites given American Legion 3/265. In lieu of flowers, memorial donations may be made to the Lewy Body Dementia Association, 912 Killian Hill Road, S.W., Lilburn, GA 30047, or American Legion Posts 3/265, 301 Louis St #301, Kingsport, TN 37660.